Compression fittings are made in accordance with DIN 2353/ISO 8434-1 standard, equivalent to EO Fittings. They are also known as DIN type tube fittings or tube connectors. DIN fittings are designed for hydraulic oils application and are consists of nut, sleeve, and fitting body. The series of compression fittings are determined by tube sizes namely, LL series, L series, and S series. The working pressure is determined by the series and tube sizes. 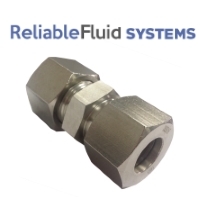 DIN fittings are available in brass, steel, and stainless steel. ​DIN Type Compression Fittings are made in accordance to DIN 2353/ISO 8434-1 standards. They are also known as DIN Compression Fittings, Bite Type Fittings or Single Ferrule Fittings, and commonly used to connect tubes and hydraulic lines. They are also often used for hydraulic and lubrication oil, fresh water and sanitary applications. A DIN fitting is consists of three components, namely fitting body, nut, and sleeve. ​Compression fittings are generally made with three materials: Brass, Steel and Stainless Steel. To protect fittings from corrosion, an additional process is carried out. The process is passivation for stainless steel, white zinc plating for steel, and acid cleaning for brass. Compression fittings are available in three series, which is LL series, L series and S series. The available sizes depend on tube outer dimensions (OD) which ranges from 4MM OD to 42MM OD. Pressure rating varies for each series. For LL series, the maximum working pressure is 100 Bars. For L series, the highest pressure rating is 315 Bars, and for S series, the highest pressure rating is up to 630 Bars. However, take note that the pressure rating of the fittings is also affected by the sizes. In general, larger sizes will have lower working pressure. Before assembling DIN fittings with tubes, we need to put attention on some details. The material of fittings and tubes must be similar, except for copper tubes, which are used together with brass fittings. Saw machines are recommended for sawing off tubes. After sawing off the tube, do use de-burring tools to lightly deburr the inner and outer diameter of the tube ends. We also need to lubricate the threads of the nut and the body of the fittings, the cutting ring and the 24˚ cone using a suitable lubricant like anti-bloc fett. Please note that normal grease is not recommended for lubrication. To assemble the fitting with the tube, first, place the pre-oiled nut and cutting ring over the tube in the right direction. Then, insert the tube into the fitting body, up to fitting stopper with nut and cutting ring. Then, hand-tighten the nut, and wrench tighten 1 1/4 turns, by holding the fitting body with a second wrench, for final assembly. Please note, that we should turn the nut instead of the fitting body. After that, check the penetration of the cutting ring. The pressures specified are in accordance to DIN 2401 part 1 draft. The pressure has a safety factor of 4 times according to DIN 3859 standards.